As most people in my resident Sonoma County are starting to think of rich fall foods and full-bodied wines, as always, I am doing my own thing. I am getting into the last of my favorite white wine finds of the year and mourning as they disappear from my shelves and fridges. I thought I would share my list so you can stash up on those that are still available, or begin planning amazing purchases for next year as these wines became my must have splash in a glass on sunny warm days. I would like to say these wines are in no particular order, but I am not a good liar even in type. I love them all, but some I just can’t get enough of, some I wish I had more of and some I feel grateful I got to try them. All of them will be purchased again with the exception of the ones that will not be made anymore…insert crying emoji here! 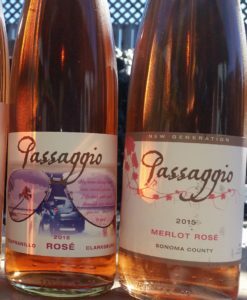 Whether you want to taste this line up, or make up a mix of your own I always find pleasure when enjoying the bounty of Sonoma and surrounding counties. Cheers to a delicious line up of spectacular adventures in white wines! Rose that is too cool for my summer! I have some usual suspects of the pink persuasion that I consider my go to summer sipping pinks, but I always leave room to try new flavors. 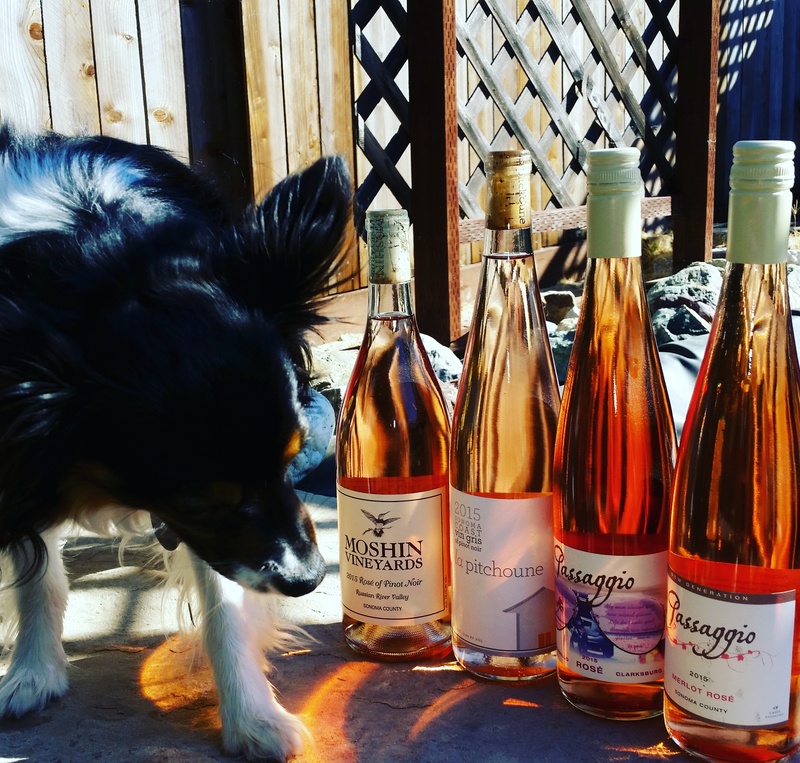 I love a flirty rose of pinot noir just as much as I enjoy the adventure across the many other varietals that show a sassy lighter side in pink. 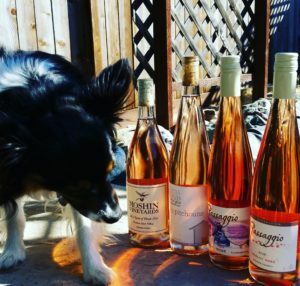 Due to changes, timing & the sadness that surrounds sell outs of the favorites here are the rose wines that I’ve been sipping on for the summer (Koda not included). 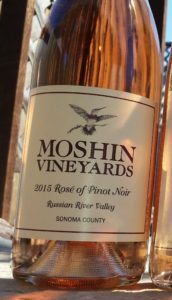 2015 Moshin Vineyards Rosé of Pinot Noir has aromas of watermelon kissed strawberries that dance onto your palate with silken scarves that caress ever so gently. This wine has a perfect amount of acidity showing it to be friendly as the crowd stopping smile that genuinely laughs at all your best jokes. This is the wine friend you can introduce to everyone & know it will be a pleasure. Easy drinking all year long! 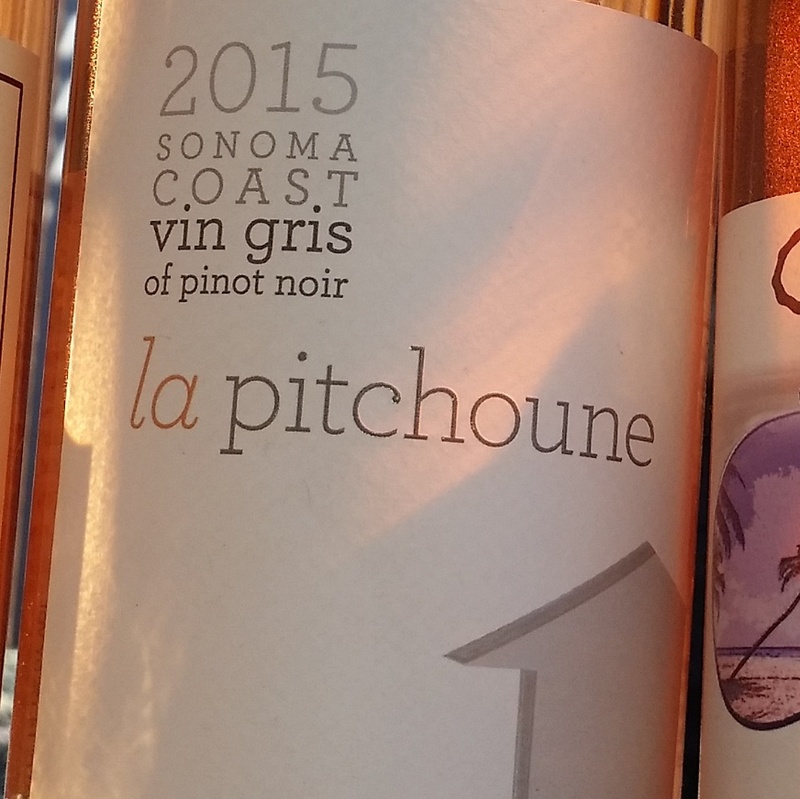 2015 La Pitchoune Vin Gris of Pinot Noir quickly lured me in with the aromas of sun kissed blood orange juice with bountiful red berries. Strawberries & blood orange peel on the palate linger for the lovely intrigue of vacation. There is a refreshing brightness of young strawberries that changed from an adorable flower to the promise of a delicious treat. Perfect lip smack sound hits the mid palate offering a beautiful dryness that is dreamy on a warm evening. 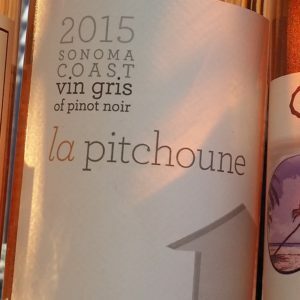 La Pitchoune Winery offers their lovely wines or where they can be found on the website: http://www.lapitchounewinery.com/ Grab up some of this rose while it lasts & before the summer is gone. I know ya’ll need sips after work or after the school shuffle. 2015 Passaggio Merlot Rosé is an adventure worthy glass with a cornucopia of flavors. Upon first sip it was a symphony of watermelon, sweet pie cherries & raspberries. Like balanced notes on your favorite songs chords, this wine seemed held together with a whispered hint of salinity from a breezy ocean vacation day. As the glass opens up into the warming temperatures a beautiful pomegranate note appears. 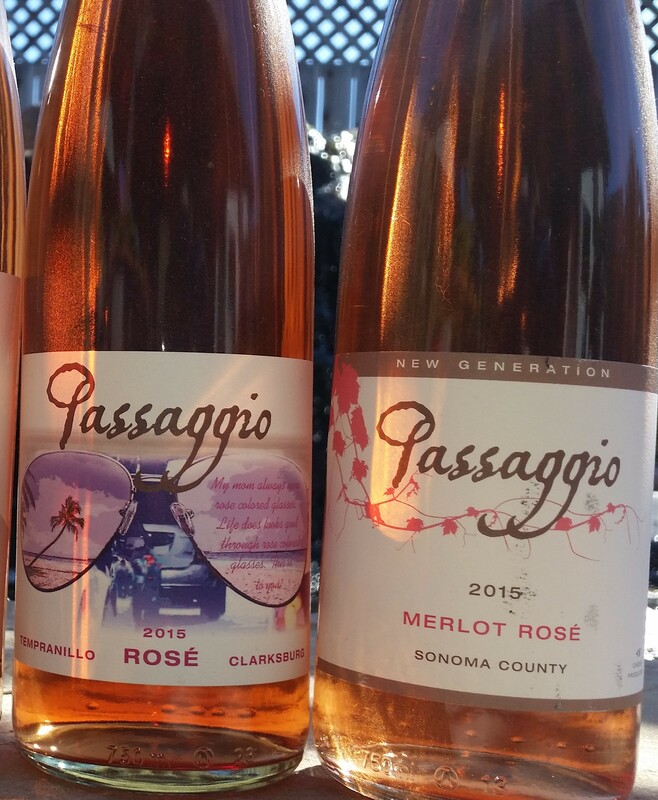 The last wine is also a discovery from Passaggio Wines…side bar moment. I have found it to be a true joy wondering what rose game the lovely winemaker will dive into each year. 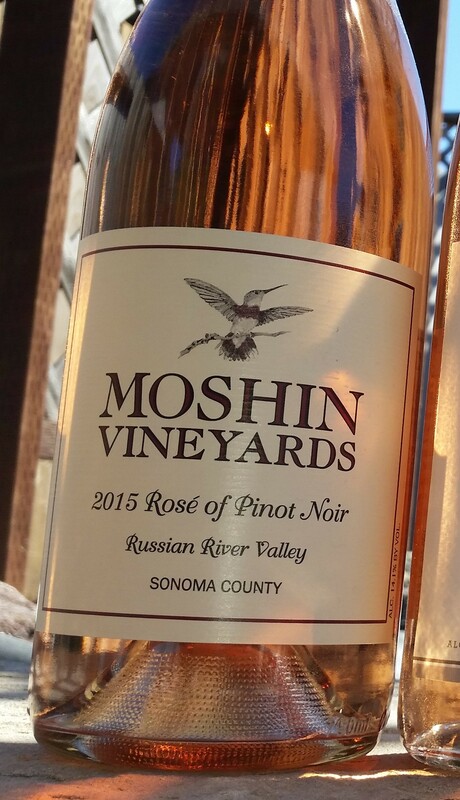 Last year I enjoyed the Mourvedre Rose as well as the stunning Barbera Rose. Can’t wait to discover what will appear for me in 2017…(note to self: slow down, you’re way ahead of yourself here). 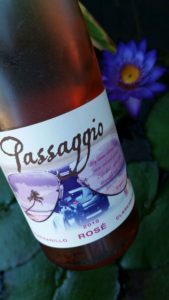 Lastly the ever playful take on a favorite red varietal of mine, 2015 Passaggio Tempranillo Rose aka “Rose Colored Glasses”. This wine dazzles with bright light cherry notes that play with lovely red current through a savory hint in the aromatic entertainment. I found flavors of guava & strawberry hinting through the glass as it opened. There is a savory side to this glass that would play well with light garlic white wine sauces of summer seafood dishes. For me this wine screams for a relaxing wine country summer picnic with a simple charcuterie plate & neighboring cheeses, such as manchego, as well. So good, it deserves a double take. I’m salivating at the thought! Cheers to all end of summer sipping!! !